LUTZ -- Motivational speaker Ken Davis hit the stage at Van Dyke Church on Thursday, doling out a message that at some points had the audience roaring with laughter and, at other times, listening in reflective silence. This wasn’t just any crowd. 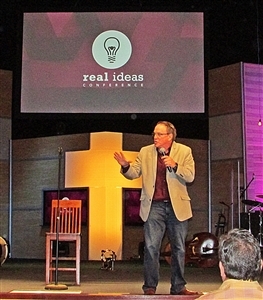 About 650 people gathered at the 2014 Real Ideas Conference, coming from at least 177 churches and traveling there from communities as close as Tampa and as far away as Fairfax, Va. It was the highest attendance ever for the two-day conference that started eight years ago. Davis is no ordinary speaker. Motivational speaker Ken Davis talks about finding joy in God to a record crowd at the annual Real Ideas Conference at Van Dyke Church. Photos by B.C. Manion. He is a radio personality and best-selling author who provides communications training in seminars across the globe. His appearance came through a partnership between the Real Ideas Conference and the Florida Conference Institute of Preaching. Most of those assembled were United Methodist clergy, church staff and volunteers, but Baptists, Lutherans, Presbyterians and attendees from non-denominational congregations also turned out. Davis set an energetic tone for the gathering. He regaled the crowd with funny and touching stories, talking about key moments in his life: his daughter’s birth, her wedding day, the terror the family experienced when his 4-year-old granddaughter went missing from a campsite high in the Colorado mountains and the blessed relief they felt when she was safely found. He used comedy to inspire and delight, and he delivered some food for thought. “God is the author of joy. He is the one who created joy,” Davis reminded the crowd. But not everyone remembers this, he said. Davis acknowledged that he could relate to Thoreau’s sentiment. “I found myself in that very place, in the middle of the most successful time of my life, leaning on the wrong things for my joy,” Davis said. “God turned my life around. He brought me back fully alive. “I want to hang with people who understand that God is the author of joy. I want to hang with people who understand that perfection isn’t a requirement and God loves them just the way they are but that every day they look to be a little bit more like him. And I want to hang with a God that can always be trusted, and I know he loves me all of the time,” Davis said. Davis wasn’t the only nationally known speaker at the conference. Bill Hybels, pastor, author and board chairman of the Illinois-based Willow Creek Association, was another big draw. Revs. 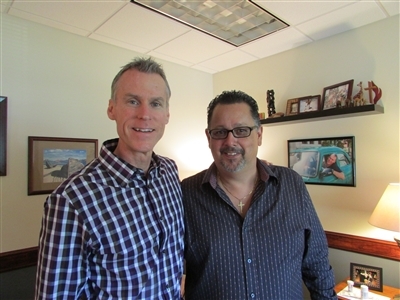 Matthew Hartsfield and Jorge Acevedo, above, have teamed up in recent years to lead the Real Ideas Conference at Van Dyke Church. 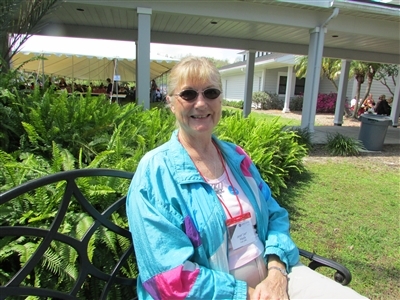 Below, Jan Hladik of Faith UMC, Fort Myers, takes a moment out from workshops at the conference. Leaders of two of the best-attended United Methodist churches in the U.S. – Rev. Matthew Hartsfield at Van Dyke and Rev. Jorge Acevedo at Grace Church, Cape Coral – have led the annual Real Ideas Conference in recent years, sharing fruitful strategies for making disciples of Christ. Florida Bishop Ken Carter also was on the program. Workshops covered everything from using social media in church marketing to connecting with millenials to managing mission partnerships and expectations. The sessions touched on every aspect of church life, from children’s ministry to congregational care, from outreach to church operations, from prayer to technology. Hartsfield said the essence of the Real Ideas Conference can be summed up in two words: information and inspiration. “We want to relay a lot of information based on our failures and successes and what we’ve learned, but we want to do it in an inspiring way, so that hearts and minds are engaged,” Hartsfield said. These ideas “have been tested in the real incubator of local church life,” Acevedo said. The conference also is intended to provide encouragement, Hartsfield said. The conference reminds those assembled they have a mighty ally in their work -- that they have the God of the universe on their side, Hartsfield said. Workshops cover a multitude of issues because churches need many tools in their toolkit, Acevedo said. Conference attendees gave different reasons for seeking out Real Ideas. Steven Wells, lead pastor at St. George’s UMC in Fairfax, Va., said he was attracted by the focus on a broad spectrum of ministries. “I’m newly appointed this past year as pastor, and we’re setting a new course for the future,” said Wells, who also brought two staff members from his church. Nancy McCall, a volunteer at Seminole Heights UMC, Tampa, said her church is seeking to expand its outreach efforts. She attended a preconference session on adopting a school and said the speakers and materials were excellent. The speakers provided a clear sense of what would be required, including practical matters such as a template for an agreement, forms that would needed and so on. Jan Hladik of Faith UMC, Fort Myers, coordinates her church’s ushers and greeters. She came to the conference looking for concrete advice on how to increase the pool of volunteers. She was impressed by the preconference session she attended.